Purefit KETO is a diet pill that’s only available online. 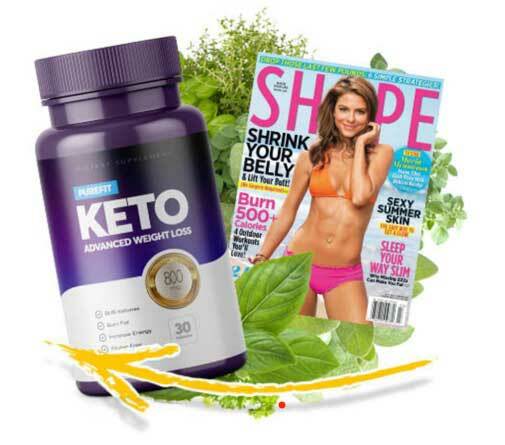 It’s primarily aimed at dieters who are interested in forcing their body into a state of ketosis. When this condition is achieved the body becomes so starved of glucose it has to fuel itself by burning fat instead. 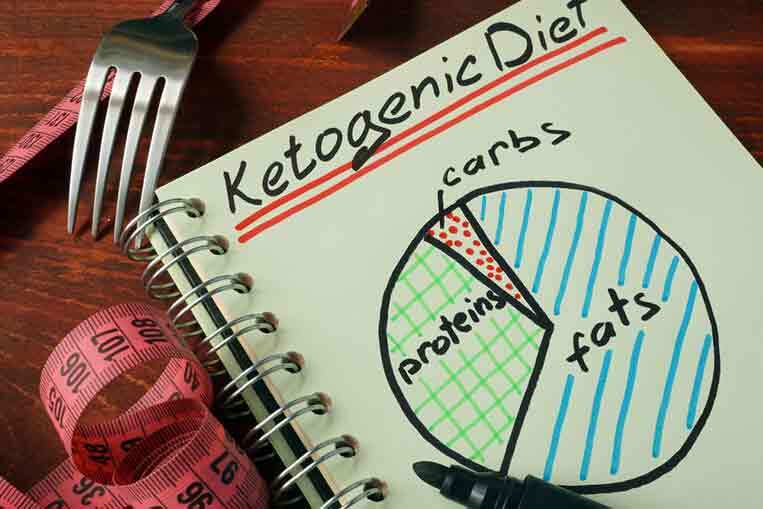 People following the Keto Diet achieve the same effect by switching to a diet that is ultra low in carbohydrate, but higher in fat. Some diet pill manufacturers have created formulations designed to make it easier to attain and maintain a state of ketosis by blocking carbohydrate absorption. 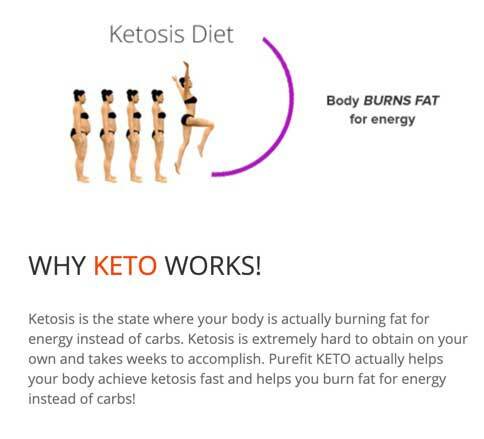 A good explanation of Ketosis is where your body is actually burning fat for energy instead of carbs. Ketosis is virtually impossible to achieve without intervention and can take several weeks to accomplish. Purefit KETO aims to speed up the process of your body achieving ketosis and helping you burn fat for energy instead of carbs! 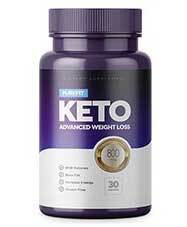 PureFit Keto is available to buy online from the official website only. 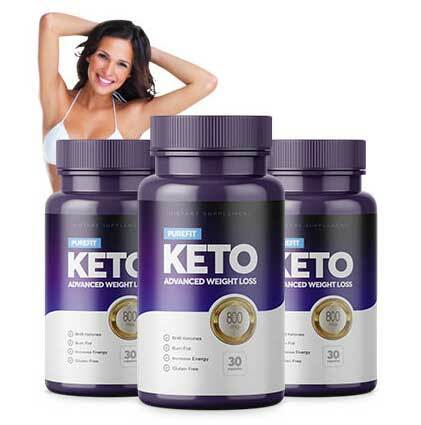 A list of ingredients is not provided, but the official sales page states the formulation encourages ketosis because it contains Beta-hydroxybutyrate (BHB). D-BHB: The body produces this in high amounts and burns it for energy. L-BHB: The body produces less of this and, although it is not a particularly good energy provider, it does assist the synthesis of fatty acids. The company behind Purefit KETO claim when Purefit KETO is taken in supplement form it starts “processing in your body” resulting in extra energy. The science seems shaky. If the body is obtaining enough extra energy in the form of BHB, how would this make it begin to convert fat to BHB? They also allege BHB can heighten “mental acuity”, but experts don’t recommend its use as a psychiatric aid. However, the sites FAQs page suggests Purefit KETO does not contain BHB at all. In answer to the question, “What ingredients is Purefit KETO made from?” it states “This special serum is made from 2 key ingredients: Sanguinaria Canadensis and Zincum Muriaticum. Also called bloodroot, Sanguinaria Canadensis is a plant that is sometimes used to trigger vomiting, empty the bowels and work in a few other ways that are unlikely to support weight loss. Zincum Muriaticum is an unapproved homoeopathic ingredient that is sometimes used as a treatment for constipation. Usage Instructions – The recommended dose is two capsules per day. That makes this an extremely expensive product to use because there are only 30 capsules per pot and, at a rate of two capsules per day, each pot will run dry after just 15 days of use. We were unable to find a reliable source of Purefit KETO customer reviews. People who use keto dieting techniques are often plagued with bad breath. Other than that there is no way to be certain what the potential side effect of using this product might be (if any) because there are doubts about what the formulation actually contains. If you are thinking of using this product, the only safe course of action would be to take the bottle along to a doctors appointment, let the doctor in question examine the label and then decide if it is safe for you to use. It’s only possible to buy Purefit KETO via the official website. This entry was posted in Non Prescription Diet Pills and tagged Purefit KETO Australia, Purefit KETO Coupon Codes, Purefit KETO In Chemists, Purefit KETO Malaysia, Purefit KETO New Zealand, Purefit KETO Priceline. Bookmark the permalink.